Wolverines are the largest terrestrial members of the weasel family, weighing in at 20-40 pounds as adults and measuring around three feet long. An individual’s home range can cover an astounding 500 square miles. All of Yellowstone National Park, at 2.2 million acres a bigger area than the states of Rhode Island and Delaware put together, is probably only home to a handful of these carnivores. The Greater Yellowstone Ecosystem is one of the few strongholds for the wolverine in the Lower 48. Because the shaggy animals require persistent snowpack (a range map of the wolverine closely correlates with a map showing areas that remain snow-covered until at least May 1 each year, said Murphy) and cool summer temperatures, they tend to be found only at high latitudes or high elevations. Perhaps my favorite thing about wolverines is that they possess massive, bone-crushing jaws that pack one of the strongest bites in the mammal world. Counterintuitively, that almost unimaginable biting power is mainly wielded against the already dead. The lower jaw of a wolverine is massive. The skull shape shows a sagittal crest that serves as an anchor point for powerful jaw muscles, while the cheekbones (or zygomatic arches) curve far outward to make room for these muscles. The short muzzle means increased leverage and a stronger bite. Photo by R. B. Forbes, © American Society of Mammalogists, via the Smithsonian. In the winter, wolverines feed mainly on scavenged, frozen carcasses of animals like mountain goats or bighorn sheep. The strong jaws probably evolved so that wolverines could crunch through meat and bone that had frozen solid, taking advantage of a food source that remained inaccessible to other animals. Wolverines are capable of taking down large prey—a 25-pound wolverine once brought down a 300-pound caribou—but they specialize in using their acute sense of smell to detect hoofed animals buried by avalanches. They dig through packed snow and ice with their muscular forelimbs and long claws in order to feed on buried, rock-hard meat and bone marrow. Wow. It seems as if an animal like this could survive anything, right? 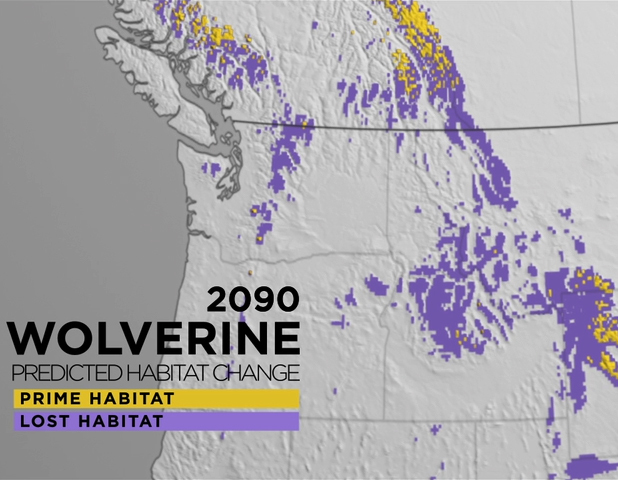 Climate change models predict that most current wolverine habitat in the Lower 48 will no longer be suitable for these animals by 2090. American Museum of Natural History. A 90-day public comment period opens on Monday, February 4. I urge you to read up on the proposal to list the wolverine and submit your input. I’ll be commenting in support of listing the wolverine as a threatened species. I hope you join me to encourage the long-term protection of these magnificent animals. And, one more time, the US F&WS page on the proposed wolverine threatened species listing. Go forth and comment. Such a wonderful post… Another sadly, wrongfully demonized critter. So incredibly fascinating — I can’t believe they’re not listed as threatened yet, given this info. Thanks for the links. Wolverines should have been listed years ago, and they should be listed as full-on endangered, not just threatened. Still, this is better than nothing. Please help spread the word to support according wolverines threatened status. It is too bad that we have to list a species in order to manage for sustainability. A lot of agencies are doing a lot wrong to get it to that point. If I read the articles right, trapping is not supposed to be a significant threat to them but it still makes me wonder, what is the value of five dead wolverines per year per trapper. Are their pelts worth that much? The answer is probably buried somewhere in the literature, I just haven’t found it yet. I knew very little about wolverines, so thanks for helping me learn about this unique species. I admire any animal that is so highly evolved, while at the same time that makes them less able to adapt.